If you’re not aware, Al Gore is back with an update to his Oscar winning Powerpoint presentation, An Inconvenient Truth. 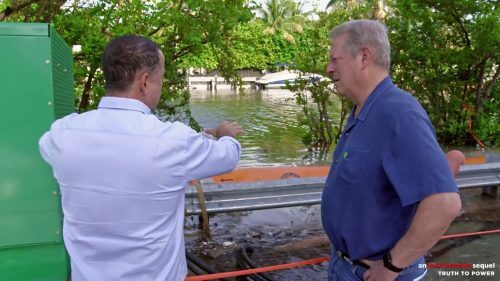 This time we’ve been sent a clip form the film where Al is in Miami finding out how the city is coping with the rise in sea level. If you have missed the trailer, head over to this page to watch how much things have changed in the ten years since the first time Al Gore told an Inconvenient Truth. In AN INCONVENIENT SEQUEL: TRUTH TO POWER Vice President Al Gore continues his tireless fight traveling around the world training an army of climate champions and influencing international climate policy. Cameras follow him behind the scenes – in moments both private and public, funny and poignant — as he pursues the inspirational idea that while the stakes have never been higher, the perils of climate change can be overcome with human ingenuity and passion.